Maybe it was the snow, don't know, but we affectionately named this car, "Rosebud". The 69 Plymouth was all about bland, indiscriminate styling. It was already an old, but reliable clunker. Don't know if it was an eight or one of Chrysler's ever trusty slant sixes. Can't say I remember too much about this car at all, except it was a dark yet faded brown. 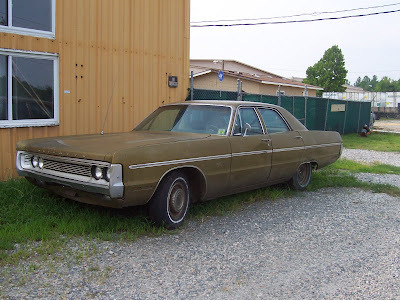 I know I had it while I lived on the farm in Hanover, PA. My clearest memory of it was one day while parked in the driveway, and my girlfriend at the time, removed all the bolts from a wheel that had a flat tire, BEFORE jacking it up. I was like, "Are you crazy? Back away from the car." She was pretty mad at me for yelling at her. I'm still trying to figure out where this really fit in the chronological pantheon of my cars. Weird. It's like the sixties lasted into the seventies. Did I actually own this car before the VW van? I'm starting to think so.